While we nacho fans all spent the previous Monday celebrating National Nacho Day, there was sadly one who did not. 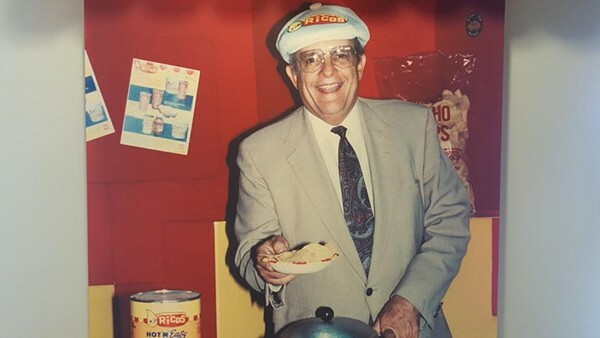 Frank Liberto: inventor of the concession nacho, inventor of the shelf-stable cheese, founder of Ricos Products Company, Captain in the Army, 1994’s South Texas Entrepreneur of the Year, passed away on November 5th, one day shy of the day he was partially responsible for, surrounded by family at his San Antonio home. He was 84 years old. It is beyond a doubt that Ignacio Anaya is the king and father of nachos, and Carmen Rocha the mother and queen, but Frank Liberto was more the bad boy prince or cool uncle that rides a motorcycle and wears sunglasses indoors. Ignacio didn’t do much to spread the word of nachos outside of Piedras Negras, and while Carmen brought them to Los Angeles they still never really hit critical mass. It wasn’t until Frank got his brand of concession nachos into Texas Stadium and up into the mouth of announcer Howard Cosell that they reached a tipping point. Cosell, ever the loquacious gentlemen, thought the name was hilarious and started using “nacho” as noun, verb, adjective, and however else he felt like saying it, blurting out things like “That was nacho man!” and “What a nacho run that was!” While some men would have declared their love for the food by going on about how tasty this combination of chips and cheese and spicy jalapenos was, Cosell put his own unique take on things, and low and behold, that did the trick. Word of the dish traveled throughout the land, making what could have just been a niche southern Texas dish a worldwide phenomenon. Frank Liberto has always been a controversial figure in the world of nachos, with many blaming the concession nachos for the bad rap nachos have gotten over the years as a second class food. Despite this, there is no doubt that without him most Americans would not be aware of the dish and they would not be nearly as well knows as they are today. You may not want to eat the nachos you see in a movie theater of sports stadium in favor of the artisanal ones down at your local gastropub, but if it wasn’t for Frank they probably wouldn’t even be on the menus of most places. The real tragedy here is that not only is a man dead and a family left grieving, but the last living member of nacho history is gone. With the holy trinity of Ignacio, Carmen, and now Frank all having passed, there is nobody on the scene today who was down in the trenches and shoveling that nacho cheese in order to have the good name of the food take root in the world. This is what the passage of time does, and nobody from the lowliest nacho serf to the mightiest nacho king can avoid it. So goodnight you prince of nachos, you king of San Antonio, I will slowly pour out a container of Ricos Gourmet Nacho Cheese Sauce for the fallen. You will be missed.